If you’ve ever shopped for a mattress in-store or online, you’ve probably seen or heard of Serta’s line of mattresses. The company has a long history in the business and numerous models to choose from (so many that it can get confusing at times!). If you’re curious about Serta and what they have to offer, we’ve got you covered. 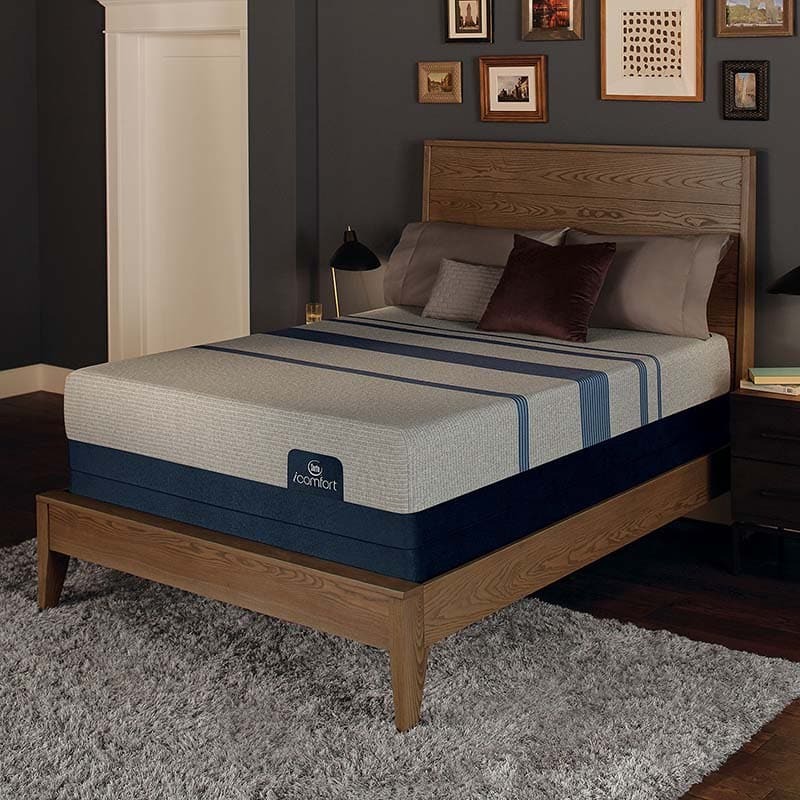 Check out our complete guide to Serta below. Serta is a mattress manufacturing company based in the United States. It was founded in 1931 when the name was licensed by 13 independent mattress manufacturers. It was originally headquartered in Hoffman Estates, Ill., and its headquarters remain there as of 2018. In 2005, Serta was purchased by two private equity groups, The Ares Corporate Opportunities Fund and Teachers’ Private Capital. In 2012, the company was acquired by private equity company Advent International. As of 2016, Serta Simmons Holdings LLC, its subsidiary Serta International, and associated companies Simmons Bedding Company and National Bedding Company, LLC are all owned by Advent International. Serta possesses 27 manufacturing facilities total, 23 of which are located in the United States and four of which are located in Canada. 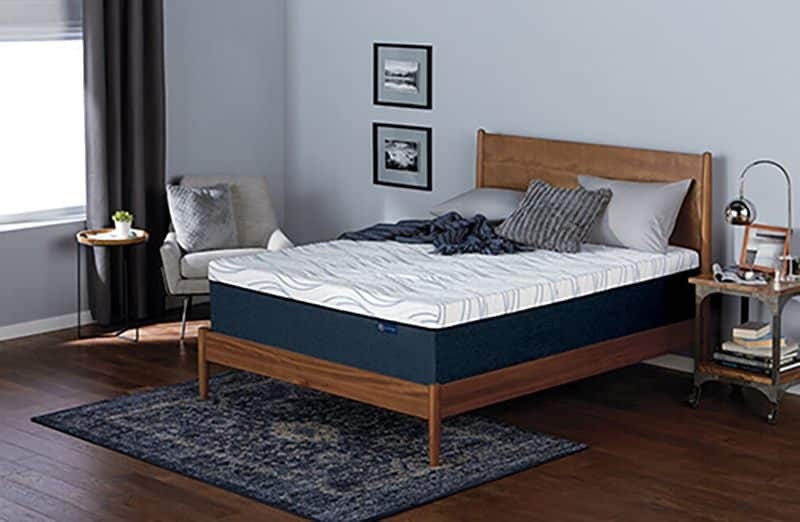 Serta categorizes its products into three primary mattresses types: those with a traditional innerspring design, those made of gel-infused memory foam, and hybrid mattresses that combine both technologies. Within each of these categories, Serta manufactures multiple lines of mattresses, each of which is manufactured at a specific facility or set of facilities that are part of Serta. Most of these lines have trademarked names. Let’s take a look at these different product categorizations. Traditional innerspring mattresses provide support via coiled springs inside the mattress. 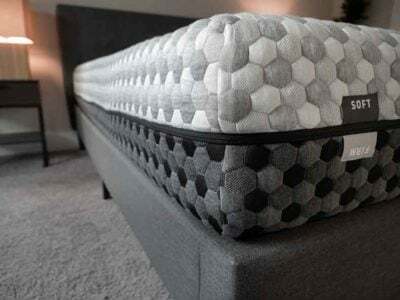 As a general rule, these types of mattresses include three layers: a spring core (which contains the coils), an upper upholstery layer, and a bottom upholstery layer. Memory foam mattresses generally contain no springs (unless they are a hybrid). They typically use conforming visco-elastic foam for the outer layers and firmer foam for the core. 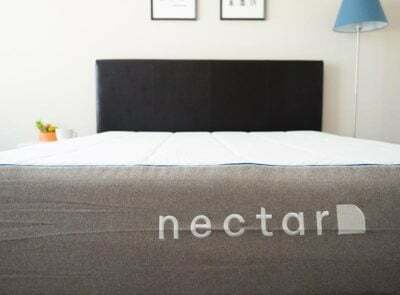 Hybrid mattresses contain some combination of both innerspring and memory foam components. Often this is achieved by using conforming foam to serve as the upholstery layers for a mattress with a spring core. This reduces the cost of manufacturing compared to a core made entirely from foam. It also changes the feel of the mattress a bit. Serta products are marketed for both corporate and home use. They are frequently employed in the lodging industry by companies including Hilton Worldwide and Wyndham Worldwide. Some of Serta’s mattress lines, such as the “Serta Hotel Mattresses” collection, specifically target use in the lodging industry. Others are targeted more toward everyday consumers. What Mattress Collections Fall Under The Serta Brand? The Excursion Super Pillow Top comes in Twin, Full, Queen, King, and California King. The Kirkville Super Pillow Top comes in Twin, Twin XL, Full, Queen, King, and California King. The Castleview Cushion Firm Euro Pillow Top comes in Twin, Full, Queen, King, and California King. The Coralview Plush comes in Twin, Twin XL, Full, Queen, King, and California King. The Coralview Firm comes in Twin, Twin XL, Full, Queen, King, and California King. The Castleview Plush comes in Twin, Full, Queen, King, and California King. The Castleview Firm comes in Twin, Full, Queen, King, and California King. The Luxury Hybrid Glenmoor Super Pillow Top comes in Twin, Full, Queen, King, and California King. The Perfect Sleeper Express 14 inch comes in Twin, Twin XL, Full, Queen, King, and California King. The Perfect Sleeper Express 12 inch comes in Twin, Twin XL, Full, Queen, King, and California King. The Perfect Sleeper Express 10 inch comes in Twin, Twin XL, Full, Queen, King, and California King. The Blue 500 Mattress comes in Twin XL, Full, Queen, King, and California King. *Note: This model is no longer offered at Serta.com, but it may still be available at select retailers. 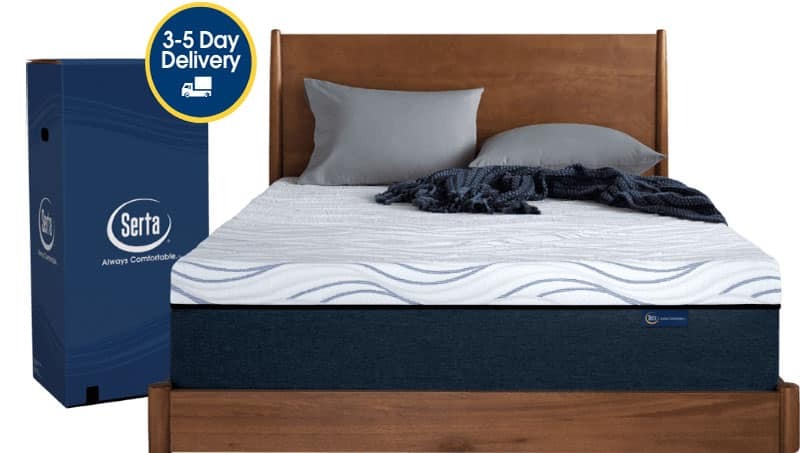 The Blue 300 Mattress comes in Twin XL, Full, Queen, King, and California King. The Blue 100 Mattress comes in Twin, Twin XL, Full, Queen, King, and California King. The Blue Max 5000 Elite Luxury Firm comes in Twin XL, Queen, King, and California King. The Blue Max 3000 Elite Plush comes in Twin XL, Queen, King, and California King. The Blue Max 1000 Cushion Plush comes in Twin XL, Full, Queen, King, and California King. The Blue Max 1000 Cushion Firm comes in Twin XL, Full, Queen, King, and California King. The Blue Fusion 5000 Cushion Firm Pillow Top comes in Twin XL, Full, Queen, King, and California King. The Blue Fusion 3000 Plush comes in Twin XL, Full, Queen, King, and California King. The Blue Fusion 1000 Luxury Firm comes in Twin XL, Full, Queen, King, and California King. *Note: This model is no longer offered at Serta.com, but it may still be available at select retailers. The Blue Fusion 1000 Luxury Firm Pillow Top comes in Twin XL, Full, Queen, King, and California King. The Blue Fusion 1000 Plush Pillow Top comes in Twin XL, Full, Queen, King, and California King. The Blue Fusion 500 Extra Firm comes in Twin XL, Full, Queen, King, and California King. *Note: This model is no longer offered at Serta.com, but it may still be available at select retailers. The Blue Fusion 300 Plush Pillow Top comes in Twin, Twin XL, Full, Queen, King, and California King. The Blue Fusion 200 Plush comes in Twin, Twin XL, Full, Queen, King, and California King. The Blue Fusion 100 Firm comes in Twin, Twin XL, Full, Queen, King, and California King. 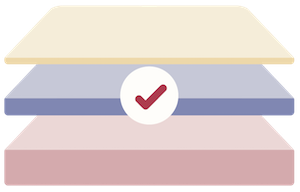 The 9″ Mattress In A Box comes in Twin, Twin XL, Full, Queen, King, and California King. The Serta SleepToGo 12″ mattress comes in Twin, Full, Queen, King, and California King. The Presidential Suite II Euro Pillow Top comes in Twin, Twin XL, Full, Queen, King, and California King. The Concierge Suite II Plush comes in Twin, Twin XL, Full, Queen, King, and California King. The Congressional Suite Supreme II Euro Pillow Top comes in Twin, Twin XL, Full, Queen, King, and California King. The Hybrid 100 Firm comes in Twin, Twin XL, Full, Queen, King, and California King. The Hybrid 300 Plush comes in Twin, Twin XL, Full, Queen, King, and California King. The Hybrid 500 Cushion Firm comes in Twin, Twin XL, Full, Queen, King, and California King. The Hybrid 1000 Firm comes in Twin, Twin XL, Full, Queen, King, and California King. What Is The Most Popular Serta Mattress? How Do I Pick The Right Serta Mattress For Me? Who will be sleeping in the bed? Which of the following sleep problems do you experience most often? Which type of activities do you typically perform in bed? Based on your answers, the website will provide a recommendation for a mattress that fits your preferences. You can also chat with a Serta representative using the online chat tool or by calling customer service at 1-888-708-1466. If you’re able to do so, it’s a good idea to test out a mattress in-store before purchasing. Below you’ll find more information about how to pick the right mattress in a store. Where Can I Buy A Serta Mattress? You can buy a Serta mattress in a mattress store, furniture store, or general department store. You can also buy a Serta mattress online from Serta.com or another online retailer. Note that mattress retailers often have sales, particularly on holiday weekends including Presidents’ Day, Memorial Day, Fourth of July, Labor Day, Black Friday, and Cyber Monday. Most mattress stores will have a knowledgeable salesperson who can help you identify a few good options. Don’t be afraid to ask questions and make your preferences known. You should test out the floor model of any mattresses you are interested in by lying down on them for several minutes (10 to 15 minutes if possible). 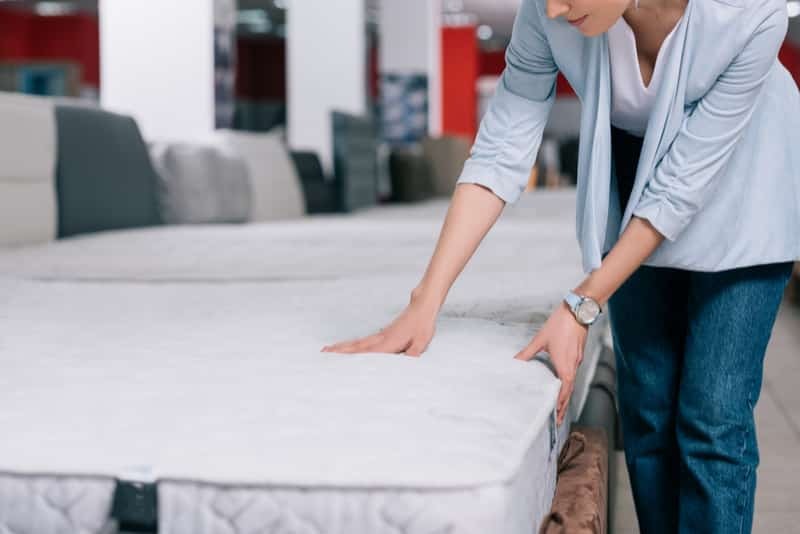 Be aware that a floor demo mattress might be softer than a brand-new one, because it will have received more wear and tear from other shoppers. If you are shopping in a store, you may be able to negotiate the price of the mattress. Some places have a price-match guarantee, while others may be open to haggling. Don’t feel pressured to make a purchase immediately, even if the salesperson puts pressure on you. It’s worth shopping around and making some comparisons before you buy. Read the reviews. 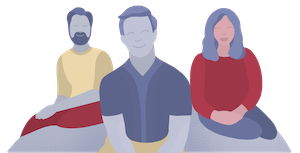 Take these with a grain of salt, but they may help you identify common issues with a mattress model or guide you towards a good fit. Look for an online coupon, referral code, or promo code. Online savings can really add up! Make sure you figure out any shipping or handling costs, as these may vary depending on the retailer. You may also be charged a sales tax. Pay attention to delivery times. Knowing when your mattress will ship and when you can expect it to arrive allows you to plan appropriately. Who Might Want A Serta Bed? People who are working with a limited budget may find many options at Serta. There are plenty of models available for under $1,000, which is not the case with many other manufacturers. People who run hot at night might like the Serta mattresses that come with cooling technologies including Cool Twist® Gel Foam, TempActive™ Gel Memory Foam, Serta® Cooling Gel Layer, EverCool Supreme Memory Foam, Cool Reaction Gel Memory Foam, EverCool Fuze Gel Memory Foam, EverCool Twist Gel Memory Foam, or EverFeel® Triple Effects™ Gel Memory Foam. One hundred percent of Serta innersprings and box springs are made from 95 percent post-industrial recycled steel. Many of the fabrics used in Serta mattress covers meet the OEKO-TEX 100 standard for manufacturing without the use of harmful substances, including cover fabrics made from natural bamboo and/or pure organic cotton. 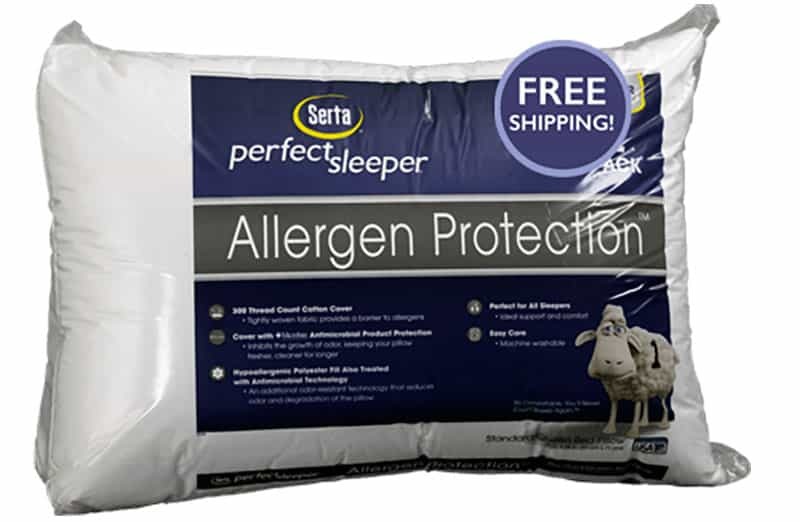 Serta uses latex made from a natural/synthetic latex blend that is naturally anti-microbial and allergen resistant. It is made to the OEKO-TEX 100 standard for manufacturing without the use of harmful substances. 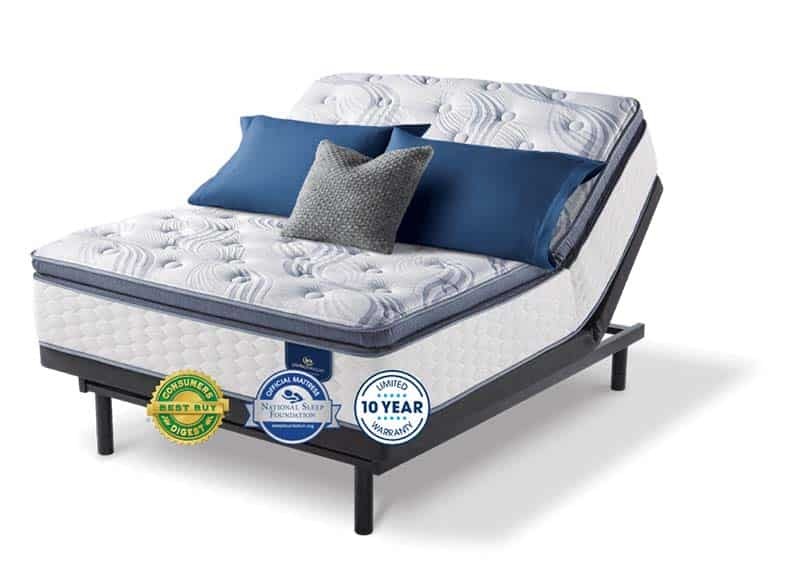 All of Serta’s foams are made without the use of PBDE flame-retardants, CFCs, lead, mercury, prohibited phthalates, and other potentially harmful materials. Soy-based foams are used in multiple product lines. Serta’s fire retardant barriers are made primarily from cotton or other cellulosic renewable fibers and use no harmful chemicals or processes. All Serta insulator pads are made from virgin recycled garment clips. Who Might Not Want A Serta Bed? People who want a waterbed. Serta does not make mattresses filled with water. People who want a mattress with adjustable firmness. Once you’ve purchased a Serta mattress, you cannot change how firm a certain model is. People who have mobility issues or are concerned about easily getting in and out of bed. Many models contain Serta’s BestEdge® Foam Encasement, but a number of reviewers say it still was not easy to get in and out of their bed. Common Praise: What Makes These Mattresses Stand Out? Especially on the memory foam and hybrid models, buyers like that the motion transfer technology means they are not disturbed by their partners or pets moving around at night. 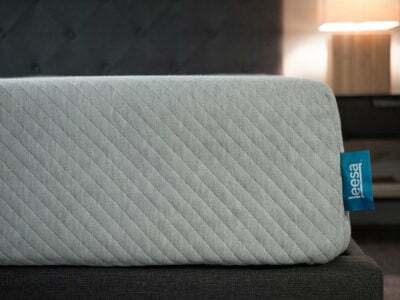 “There is little movement of the mattress when one of us get out of bed at night,” an iSeries Hybrid reviewer said. According to some reviewers, brand-new Serta mattresses take a while to break in. That means they feel extremely firm at first, which can be uncomfortable. However, the mattresses should soften over time. Some Serta mattresses are over 12” high. This means people may need to use special deep-pocket sheets to cover them. 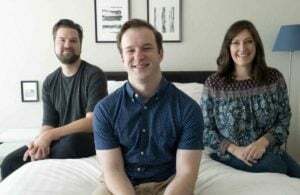 With memory foam and hybrid models, some buyers say their mattresses run hot at night due to trapped body heat. This can cause people to overheat and might disrupt their sleep. 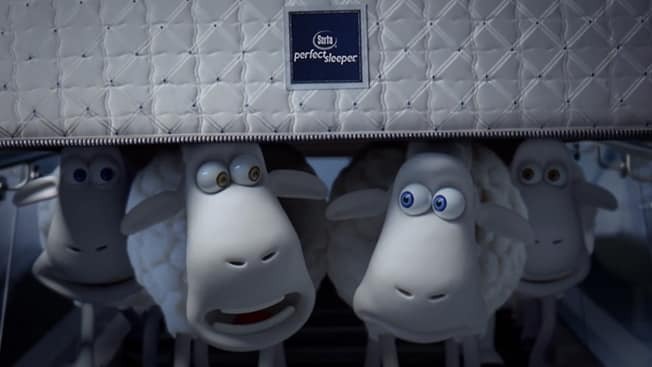 What Other Mattress Accessories Does Serta Make? 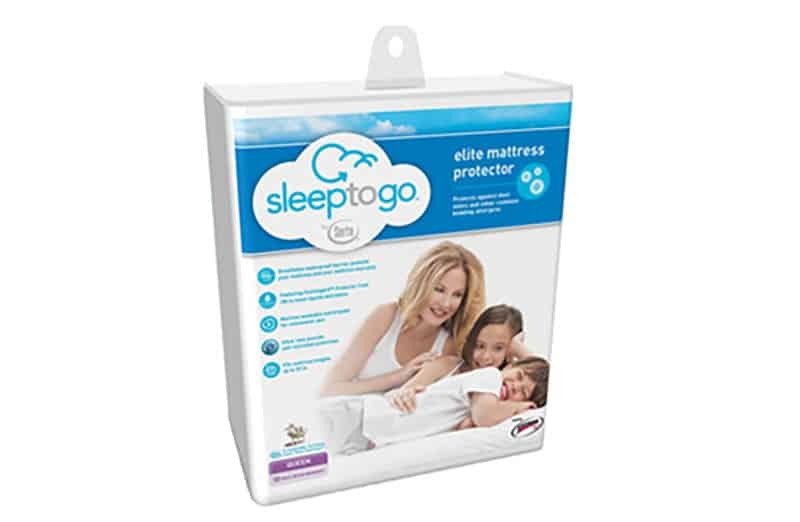 You can buy these on the Serta website when you purchase any one of the 44 compatible mattresses. Buy an iComfort or iSeries mattress or mattress/standard foundation set from us either by website or phone. 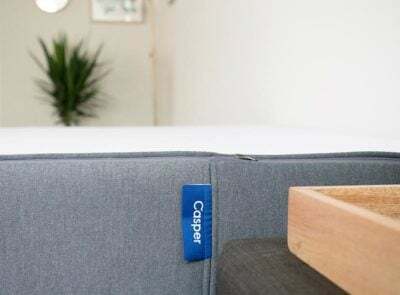 Sleep on the mattress for a minimum of 30 nights get used to your new mattress, as it takes several weeks for your body to adjust to a new (or any different) mattress. Once your body has adjusted to the comfort and support of your new mattress, you will know for sure whether or not you have made the right selection. If you are not happy for any reason within the first 120 days (and after the first 30 nights sleeping on the mattress) call our Customer Service staff 1-888-919-3174 and we will answer any questions you might have. If you are still not satisfied with your iComfort you may either select another iComfort mattress (shipping charges will apply) or return your mattress. If you wish to return your mattress or mattress set after 30 days, we will authorize the return for up to 120 days after delivery. All you have to pay is a 15 percent return and disposal fee plus $200 for shipping and handling, which will be deducted from the amount credited back to the credit card used to make the purchase. We will cover all other expenses. There is a limit of one trial offer per each consumer. This program excludes all Serta adjustable foundations, iComfort® pillows or any other iComfort® or Serta® accessories. Adjustable foundation sales are final. 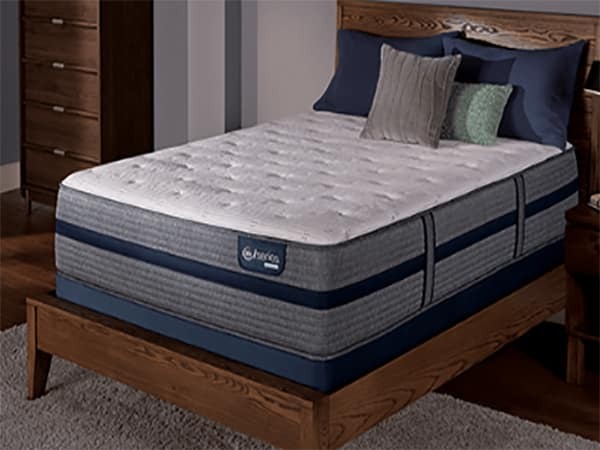 If you don’t purchase a Serta mattress directly from Serta, the trial period will depend on the specific retailer from which you purchased your mattress. Queen- and King-size mattresses require a bed frame with “center support that extends to the floor” in order to avoid voiding the warranty. A solid bed platform is okay to use; however, this platform must have “center support that extends to the floor” so you don’t void the warranty. If you have a Serta adjustable frame, ensure the mattress you use on it is compatible with an adjustable base. “Stains, soiling, fluid penetration or other signs of abuse may invalidate the warranty,” the website explains. You should never remove the law tag that comes attached to your mattress, as this could void the warranty. We hope this overview helped you better understand the Serta brand and its many mattress models. If you have specific questions about Serta, please leave those questions in the comments. I have tried and tested Serta matress and I can say that the cost is worth it. It’s very comfortable compare to other brands thatI have used.